Features: Universal Bar Hooks, Adjustable Width, Padded Grips. Includes bonus Workout Poster. 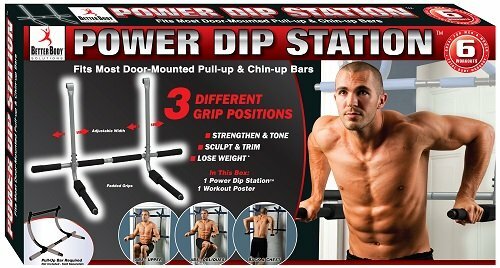 Universal Dip Station provides 8 different workouts for upper abs; chest; arms; lower abs; back; shoulders; core; obliques and arms giving you a total body workout! Increase your range of motion and workout effectiveness for fast ressults! Ideal for bent knee raises, dips, straight raises, one-handed pullups, side raises and hanging rows. Build awesome shoulders, thicker delts, and killer triceps with the Universal Dip Station. Fits standard door-mounted pull-up and chin-up bars (sold separately). View More In Dip Stands. If you have any questions about this product by Better Body Solutions, contact us by completing and submitting the form below. If you are looking for a specif part number, please include it with your message.